Pack of 10 Gable Boxes made from cardboard with a printed Union Jack across the front and back and two smaller ones on flagpoles on each side of the carton. Each gable box is made with a crash lock base making it quick and easy fold into shape. Once folded the gable box has a handle hole measuring 6cm wide by 2cm high. 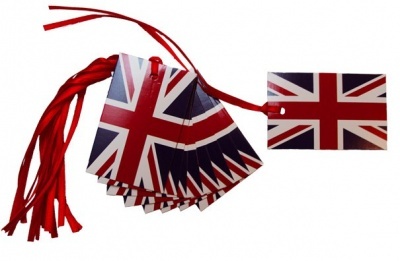 This patriotic Union Jack design looks striking with with red, white or blue accessories. Perfect for flying the GB flag all year round. Measurements are 17 x 10 x 14cm high to top of container space (20cm overall height). Great for a street party lunch box or gift party box.